Million Dollar Months app found at milliondollarmonths.com promises to make you guaranteed profits, every single time. Don’t be fooled though, as Million Dollar Months is a scam. Read our in-depth Million Dollar Months Review to find out the truth they are trying to hide from you. Million Dollar Months, founded by the alleged owner Brad Davis is a blatant scam that gives a lot of fake promises from the moment you enter the homepage. 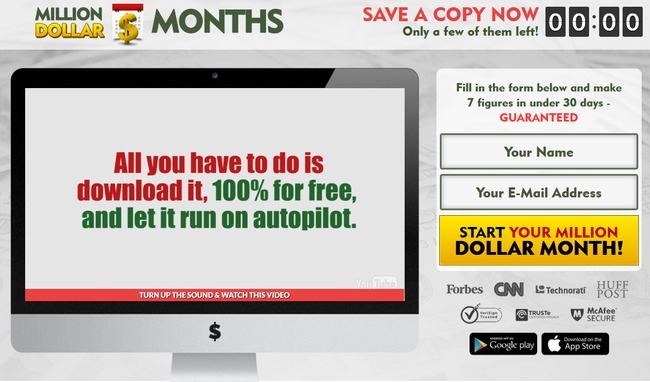 David claims that you are one of the lucky internet users who are given a chance to download his free miracle software that is guaranteed to make you a millionaire within a month. But the truth is, it won’t make you a millionaire, and it certainly isn’t free at all. There is a price to pay if you fall into this scam, and it’s not cheap. Fake guarantees (7 figures under 30 days)? Check. Hyped up and exaggerated sales video with more fake claims? Check. Unauthorized use of reputable brand icons? Check. a) Letting it run out like I did, and find that you can access the software just fine. b) Refreshing the webpage and see the timer resets itself. It’s just a computer script that starts the countdown every time you load the webpage. This is an exaggerated claim to get you excited and watch the sales video. Brad feeds your imagination by asking you to imagine a life with material possessions and financial freedom, and then proceeds to tell you his software can help you achieve just that. Best of all, you don’t have to put in any effort at all. Remember this – if it sounds too good to be true, it can’t be true. This one’s simple. Just go to Google Store or Apple Store and search for “Million Dollar Months”. There’s no such app in these stores. The same goes for other reputable websites such as Forbes and CNN. This scam wasn’t featured in these sites at all. You may recall that there are multiple positive testimonials by users of Million Dollar Months app. Every single one of them claims to have made over a million dollars, and are giving raving reviews for the app. How can it be fake when there are so many good reviews from real people? 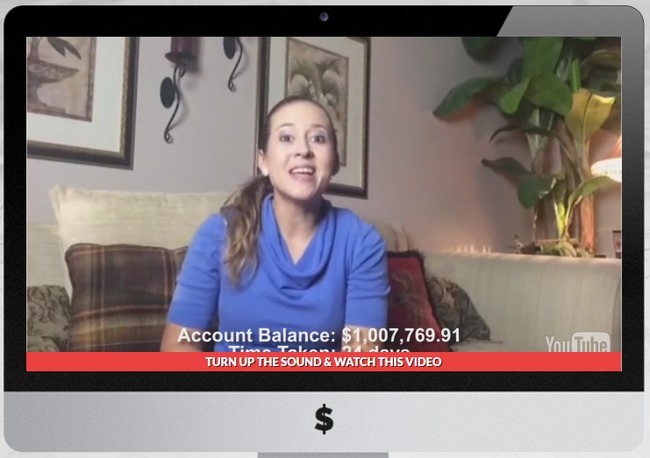 This particular “member” of Million Dollar Months scam is actually a Fiverr actress. Actually, most if not all of the fake members featured in the sales video can be found on Fiverr.com. It’s called buying a testimonial. These actors and actresses offer their services to read any script given by their client like a real testimonial. 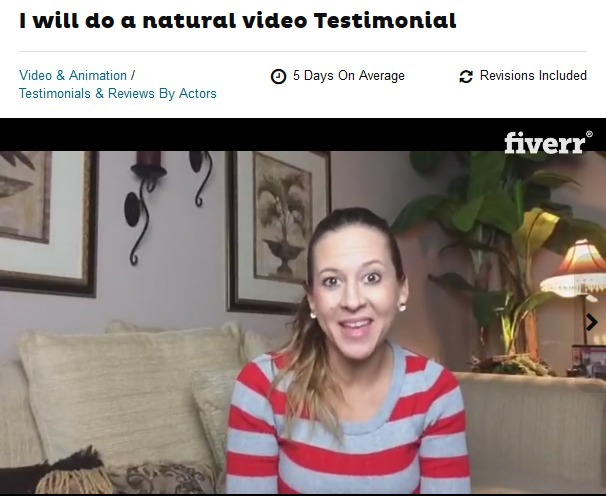 Read the description of the gig offered by this particular Fiverr actress. We have a more conclusive revelation at the end of this review, but before that, let’s detour a bit and talk about binary trading. Since this is a binary software scam, I want to briefly talk about binary trading to make sure everyone is on the same page. If you know how binary options work, you may skip ahead to the next segment. Binary options is basically trading stripped down to its simplest mode. You trade by guessing if the price of an asset will rise or fall after a short period of time, usually between 30 seconds to minutes. This is how it works – let’s say I think that the exchange rate of EURUSD will rise after 60 seconds, and I bet $50 on a 1-minute contract. When the time is up, and the price is indeed higher, I win a certain percentage of what I bet, usually between 60% to 80% (between $30 to $40). But if I’m wrong, I lose the entire $50 that I bet. In practice, trading binary options is not that different from gambling. There’s no way to predict the market movement in such a short period of time. Can you guess the outcome of a coin toss with confidence? The odds is almost at 50-50. The same principle applies to binary options. Blatant lies are told in the FAQ of Million Dollar Months scam. Brad Davis claims that Million Dollar Months app is 100% free for download and automatically wins you every trade it places. Which means, there’s no chance you’ll lose money with the app, because no loss will be incurred at all. Not only that, Brad assures you that they have not hidden anything from you and the general public. But is that really the case? 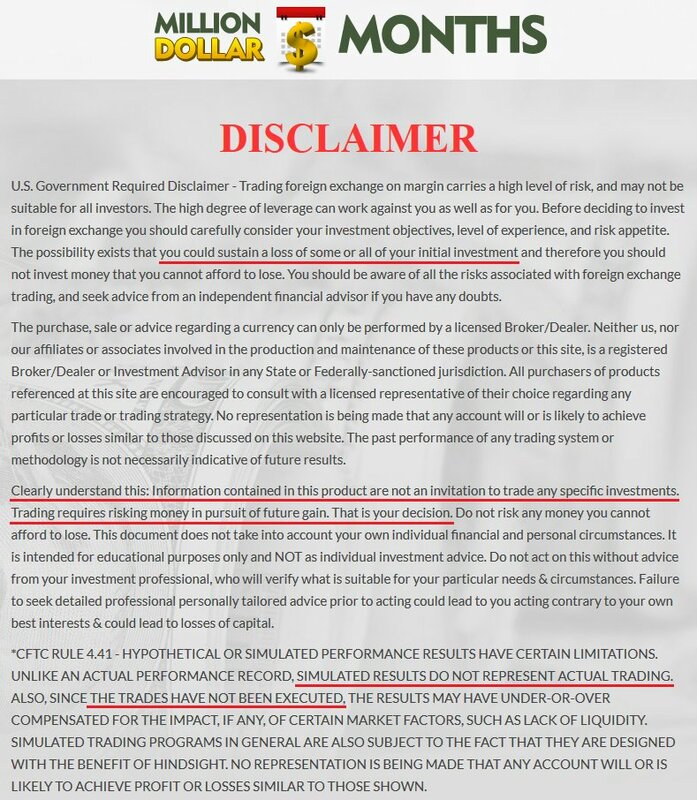 Let’s look at the disclaimer of Million Dollar Months. Despite giving you multiple promises and guarantees to make you rich, Brad Davis and Million Dollar Months have some secrets hidden in their disclaimer, after all. The link to the disclaimer can be found at the bottom of the sales pages (in fine prints), but how many people actually click into it and read it word by word? Not a lot. You could sustain a loss of some or all of your initial investments. Unlike what is promised in the sales materials, Million Dollar Months does not guarantee to make you rich. You are most likely to lose all your investments. Despite coercing you to sign up for the software, you should not view Million Dollar Months as an invitation to trade binary options. If you do sign up, it’s entirely your own decision. Note: Scams like Million Dollar Months that promise exorbitant returns are illegal in many jurisdictions. If they do not include this clause, they are deemed to illegally coerce you into signing up for the scam. These terms and conditions are not here to give you a fair warning as a consumer. The sole purpose of this document is to protect the scammers from legal actions when you lose all your money trading with Million Dollar Months app. You can’t take any legal actions because you signed up based on your own decision. If you decide to sign up for Million Dollar Months, you’ll have to register for a broker account through their sales page (which is an affiliate link). The scammers behind Million Dollar Months will earn a sum of referral fees as soon as you deposit into the account. I was assigned to Inside Option, an affiliated broker with Million Dollar Months. The minimum deposit with Inside Option is $250. Even if you already have an account with their recommended broker, you have to register for a new one using a different email address. This is because the scammers behind Million Dollar Months cannot collect their referral fees unless you sign up for a trading account through their affiliate link. YES, MILLION DOLLAR MONTHS IS A SCAM. As we’ve said in the review earlier, we don’t recommend binary options trading as a way to make money online, at all. It’s not that different from gambling, and using an automated trading software is no different. You are essentially putting your hopes and entire investment in a piece of software that gambles on your behalf.